Knitting may be a respite from the hectic pace of our digital world, but sometimes as I gaze upon the stitches floating off my needles, I realize that knitting is really a binary code; it’s zeros and ones; it’s knits and purls! Our Pixel Stitch Socks celebrate these parallels in modern life with a stitch pattern that is as soft and smooth as it is easy to work. Anzula Squishy’s striking, hand dyed palette adds complexity and depth, while the sock’s shorter length provides a satisfying, portable project you can easily take along on your next car ride or flight. K1a – With color A, knit 1. K1b – With color B, knit 1. Yoa – With color A, yarn over. Yob – With color B, yarn over. Round 1: *K1b, k1a; repeat from * to last stitch, k1b. Round 2: *K1a, k1b; repeat from * to last stitch, k1a. Repeat these two rounds for the Pixel Stitch Pattern. NOTE: In this section, work all yo’s through the back loop as you come to them. Using a Provisional Cast On and color A, cast 8 stitches onto one double pointed needle. Make sure to leave a 10-inch tail for finishing at the end. Work in Pixel Stitch Pattern (see Notes), working remaining yo through the back loop, until piece measures 6 ¼ (6 ½, 6 ¾, 7 ½) inches from cast on, or 2 ¾ (3, 3 ¼, 3 ¼) inches less than desired length from toe to back of heel, ending with a Round 2 of the pattern. Round 2: Needle 1: *K1a, k1b, repeat from * to last stitch, k1a; Needle 2: K2b, *k1a, k1b, repeat from * to end of needle; Needle 3: *K1a, k1b, repeat from * to last 2 stitches, k2a. Round 4: Needle 1: *K1a, k1b, repeat from * to last stitch, k1a; Needle 2: K1b, *k1a, k1b, repeat from * to end of needle; Needle 3: *K1a, k1b, repeat from * to last stitch, k1a. Next Row (partial row): *K1a, k1b, repeat from * to last stitch of Needle 1, k1a. Use only color A for the Turn the Heel and Heel Flap sections. You can leave color B where it is, you will come back to it later. Row 1 (right side): Needle 2: Knit; Needle 3: K7 (9, 11, 13), yo, k1, wrap and turn. Row 2 (wrong side): P16 (20, 24, 28), yo, p1, wrap and turn. Row 3: K14 (18, 22, 26), yo, k1, wrap and turn. Row 4: P12 (16, 20, 24), yo, p1, wrap and turn. Next Row: K22, yo, k1, wrap and turn. Next Row: P20, yo, p1, wrap and turn. Next Row (right side): Knit to the end of Needle 2, then knit to last stitch of Needle 3, working the wraps together with the wrapped stitches and knitting the yo’s through the back loop, wrap last stitch and turn. Next Row (wrong side): Needle 3: Purl; Needle 2: Purl to last stitch, working the wraps together with the wrapped stitches, wrap last stitch and turn. NOTE: The Heel Flap is worked with color A over just the stitches on Needles 2 and 3. You’ll be working back and forth in rows. Join again for working in the round. Color B should be ready to go, right where you left it. Next Round (partial round): *K1b, k1a, repeat from * across Needles 2 and 3. Beginning with Round 1, work in Pixel Stitch Pattern until the Leg measures 4 ½ (4 ½, 5, 5 ½) inches from the end of the Heel Flap. Repeat Round 1 until ribbing measures 1 inch. Bind off loosely in pattern, using a needle a couple of sizes larger to bind off, if necessary. Unravel the provisional cast on and slip the live stitches onto two double pointed needles, 4 stitches per needle (top-of-foot stitches on one needle and sole stitches on the other). Graft the toe closed using color A and the Kitchener Stitch. Weave in the ends. Block gently and enjoy your Pixel Stitch Socks! Thanks for writing! You can absolutely substitute and use your stash of Tosh Sock! I would just recommend knitting a swatch to make sure that you’re getting the correct gauge (33 stitches and 42 rounds = 4 inches in stockinette stitch). Good luck and thanks again for writing! So, I’ve only done socks that are cuff down…these are toe up I assume by glancing at directions. Do you have a good tutorial or video you would recommend for me to wrap my head around this method. Thanks! (I have done many pair of magic loop cuff down socks) These are beauuuuuutiful by the way! Hi Leslie, thanks for writing! 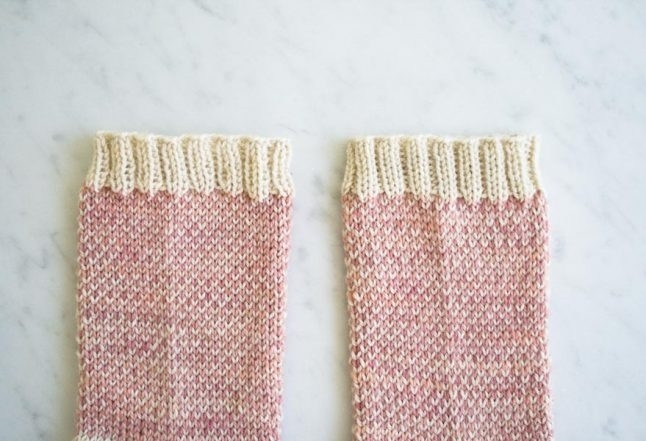 It might be useful to look at the pattern for our Little Cable Knee Highs (https://www.purlsoho.com/create/2012/11/21/whits-knits-little-cable-knee-highs/) — the steps are the same and the images hopefully the most helpful. Please let us know if you get stuck in any way or have questions as you work the socks! Yes, you would! In every size except the Men’s Large. Thanks for writing! I like the sock pattern very much. Thank you. These look beautiful! 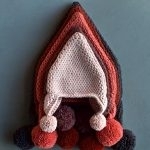 Do you have or know any great tutorials on doing this type of colorwork? 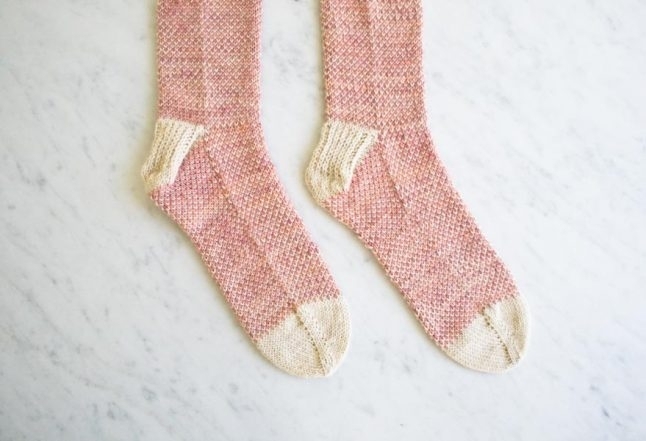 I have made a couple pairs of socks but have really never done something like this and would love to learn. So beautiful! I guess I will need to find out a clever way of how to change colour after every stitch! You don’t need to change your yarn between stitches. You just alternate so you have two balls of wool in active use throughout the pattern. I work with colour A wrapped around my index finger and colour B wrapped around my middle finger so I can work without picking up and putting down each colour. You get into a good rhythm pretty quickly. Hope this helps. 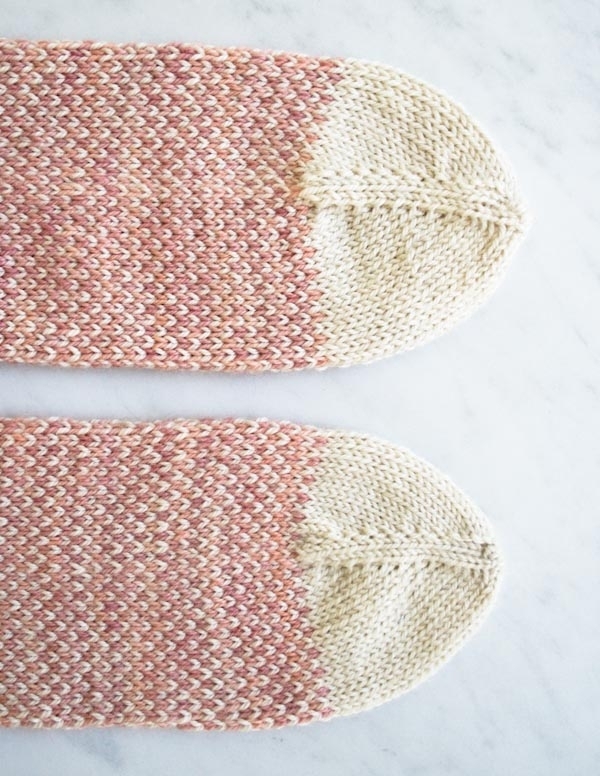 Although our Pixel Stitch socks are knit from the toe up, our Striped Crew Socks are started from the cuff and may be a good template for you to use. 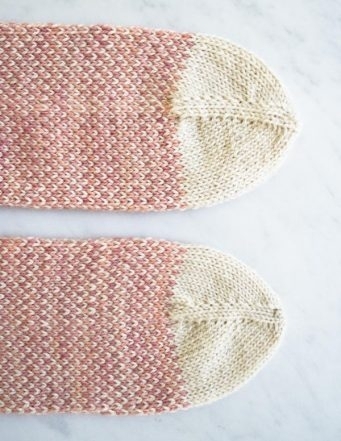 It would not be too difficult to substitute the Pixel stitch for the leg and foot of your sock (using it instead of stripes), you would just need to make sure that you worked the Pixel pattern over an odd # of stitches. You could add an extra stitch as needed to accommodate the pattern when working the heel flap and toe. If this sounds like something you might want to try, feel free to write back with any additional questions. Thanks for writing! Oh these are so lovely. I’ve not tried socks before, but think these will be the first ones I knit! So glad you like them! Thanks for your comment! 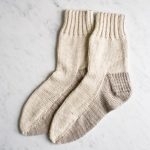 Are the skeins of yarn suggested enough for only one pair of women’s small or medium size socks or is there enough for two pair? Great question! 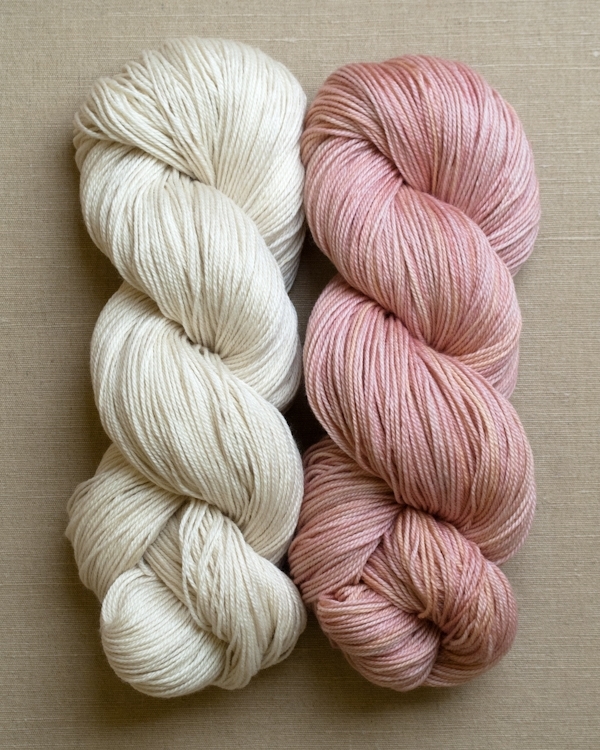 Each skein of Anzula Squishy is approximately 385 yards. For one pair of Women’s Small you will need about 160 yards of Color A and 100 yards of Color B, which should safely allow you to make two pairs out of the two skeins called for in the pattern. For one pair of Women’s medium, you’ll need about 185 yards of Color A and 115 yards Color B, which should also be enough. Thanks for asking! I wanted to start learning how to knit socks. I can knit but am wondering on how complex the pattern is. That’s great that you want to start learning how to knit socks! 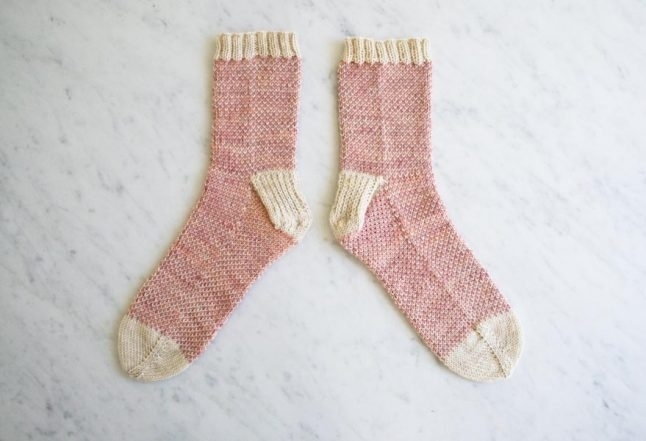 They definitely provide an opportunity to add new techniques to your skill set — a provisional cast on, working in the round, learning how to make a gusset and turn a heel — none of it too complicated! 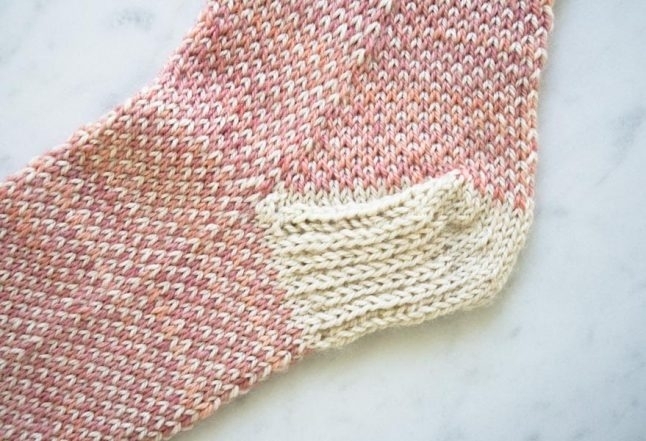 This pattern also adds color work to the mix (working the foot and leg with two colors) — and for your very first pair, I might suggest working the foot and leg smoothly in stockinette stitch, just to get the hang of the other steps. I wish you good luck and thanks for writing! Will there be enough yarn to make two pair? Yes! With two skeins of Anzula Squishy there will be enough yarn to make two pairs of every size except the Men’s Large. Thanks for asking! I have never done the provisional cast-on, but I think I understand how to do it. However, I don’t see where the piece of scrap yarn comes into the picture. It looks like I cast on with Color A, then later unravel those stitches and pick them up again to finish. I see no mention in the directions of how/when to use the scrap yarn. Can you explain? Hi Margo, gladly! A provisional cast on is just a nifty knitting trick where you use a piece of scrap yarn to keep your stitches live until you are ready to work with them again later. There are several ways to work one, and an easy method uses a piece of crochet chain. With waste yarn and a crochet hook, you chain the number of stitches that you need to cast on. For the socks, this will be 8. It’s usually helpful to chain a few extra just in case anything unravels. You then turn your crochet chain over and with your knitting needle and working yarn (Color A) you pick up stitches through the back bumps of the chain and place them onto your needle. You then proceed with your pattern until you’re ready to undo the cast on, at which time you just unravel the crochet chain, discard the waste yarn that it was made with, and place the subsequent 8 live stitches on your knitting needle. Hope this helps and please let us know if you have any further questions! This is so very Petty! Is somebody able to translate this in German? Do you think Judy’s Magic Cast on would work for these socks? That cast on should work well for the socks! Please let us know if you have any additional questions as you try it! Hi! This pattern is so cute and could definitely help me use some of my stash. How much yarn is used for a woman’s medium and a woman’s large? Thanks so much! Hi 🙂 I have been enjoying this knit and am loving the results so far. This is my first time attempting socks and while I have done short rows before I am still getting the hang of it. I am unsure if it is my inexperience or if there is an error in the heel flap section of the pattern. I am making the women’s medium size and to me it seems that in the set up row on needle 3 I’d need to knit 3, ssk, turn. Row 1: slip 1, purl 6, p2tog, turn. Row 3:as shown in pattern. Repeating rows 2 & 3 eleven times giving me 71 stitches, divided 35-18-18…Am I on the right track or am I about to make a horrible error? Hi there, I am currently knitting the women’s medium sock but have gotten confused at the heel flap section. Is it possible there’s an error in the pattern? I can only repeat rows 2&3 five times before I run out of stitches on the second and third needles. Can you please give me some direction? Hi Christie! Thanks for writing! But then when we moved into the heel flap, it said we should have 86 stitches, and I don’t see how we decrease the stitches. I thought I followed the pattern correctly, but I ended up with 87 stitches still, so I’m not sure where I went wrong. As far as I can tell, all the knitting for the heel section has been on needles 2 and 3. If that’s the case, when I get to the point where the decreases have left me with 63 stitches, I don’t understand how needle 1 has 33 stitches on it, when I haven’t done anything there. Any help would be appreciated, and thank you so much for providing this pattern! That’s exciting that these will be your first pair of socks! Thanks for your questions! For the first one, when you are ready to begin the heel flap, you’ll see that there’s an initial set up row, “Set-Up Row (right side): Needle 2: Knit; Needle 3: K13 (15, 17, 19), ssk, turn. [86 (96, 106, 116) stitches]” The “ssk” that you work (slip, slip, knit) decreases your stitch count by one stitch and that’s why the count provided at the end of that row is one less (86 instead of 87). Repeat Rows 2 and 3 ten (eleven, twelve, thirteen) more times. 63 (71, 79, 87) total stitches, divided 31-16-16 (35-18-18, 39-20-20, 43-22-22) stitches on Needles 1-2-3. Please let us know if you have any further questions as you make the socks and best of luck! Thank you Kristen for your beautiful reply to Erin’s question. I was experiencing the same difficulty and am grateful to have come back here to find the perfect correction! You worded your reply eloquently and graciously. This pattern has introduced me to many new techniques and has given me the courage to continue to try many more challenging sock patterns. I was very excited to try colorwork and this was the perfect project to learn that amazing technique. Hi Sheri, thanks so much for your comment! That’s really great that the pattern introduced you to new techniques! Very exciting! Please feel free to always write with any questions you may have, and best of luck as you finish the socks! Thanks Erin for posting this question. I ran into the exact same difficulty but, made my own correction (although it wasn’t the right correction). I never thought to write in here and ask. I learned from you that I could do that! Now I can knit sock #2 error free, hopefully . On the pixel stitch Sox… Can the magic loop method be used instead of double pointed needles? Using a circular needle, is the total cast on equal to the number of stitches on all of the DPNs ? Thank you very much for writing in! Are you thinking of doing the Magic Loop method instead of using DPN’s? If so, you would still follow the pattern as written, so the cast on of 8 stitches would remain the same. If you have further questions, please let us know! Again, thank you for writing in, we appreciate your questions and comments! Where on the foot are you measuring circumference? I’m sure it says somewhere but I am just not seeing it! Thank you for the lovely pattern and I can’t wait to get started! Congrats on getting into the color work! I also knit English, and unfortunately there is no way to completely eliminate the twisting of the two colors of yarn. I find that having the two balls of yarn in separate bags and with some space in between them on the floor helps me keep everything as orderly as possible. Keep up the hard work! I have tried to start the first set up row for a while now and am very frustrated, if I understand the instructions you have 12 stitches on needle 1 and 2 stitches on the other two, how in the world do you join them with such a difference in the amount of stitches. I have made hats and gloves etc, but the disparity is really throwing me off, any suggestions or am I just reading it wrong. Thank you Alyson, I think I have it! Have a wonderful day. Just finished knitting the first one, and it’s sooo amazing! Used different yarn so I had to start over three times to get the correct size, but it’s definitely worth it! Clear instructions, fast to knit and it feels amazing on the feet <3 Thank you for the pattern! I am delighted that you like the pattern, thank you for your kind words! I am also glad that you were able to get the correct gauge for your yarn, did you make gauge swatches or did you do trial and error? If you didn’t do a gauage swatch I definately recommend that for future projects, it’ll save you a little bit time (and maybe a bit of frustration). Again, thank you so much for writing in! Happy knitting! Im making your Pixel Stitch Socks and I am gaving trouble with the Turn the Heel. I do understand the wrap and turn but what i don’t understand the yo. Of all the wrap and turn heels there is not a yo. I am so confused. Also Row 1 says to knit needle 2 so is that much done with yarn A and B for the 9 stitches then change to color A? Thanks for writing us. The yarn over is just a simple increase in the heel area. Some patterns include increases with short rows and some don’t. If you follow the yarn over directions and knit each yarn over through the back loop, you will find that it makes a really nice heel. For your second question, you will be knitting across needle 2 and however many of needle 3 with yarn A only. I hope this helps! Good luck! When I started knitting these I’ve found that the toe part is thinner than the main colourwork part of the sock. How can I reinforce the toe to make it as thick as the colourwork section? I’m not up to the heel so I assume it’ll be the same. Thanks for writing us! Since the foot is done in fair isle, it will always be thicker than the parts done in a single strand. Unfortunately there is no way to even out the thickness without changing the gauge. Let us know how it goes! This is a lovely pattern. I think it might be easier for me though to use the turkish cast on and magic loop. I’m definitely going to make these. Thank you for the pattern. I’m loving these socks so far! But, I just want to make sure I’m understanding the heel turn/heel flap section before I get too far and have to rip it all out. I’m working the women’s medium and I just finished the heel turn/got to the start of the heel flap, all 31 of my stitches on needle 2 are color A and 15 of my stitches on needle 3 are color A – is this correct? I can’t see how this will work out to look like the pictures, but this is my first time knitting toe-up socks so I’m sure it will all come together, I just want to make sure I’m reading it correctly. I’m so happy you love these socks! Toe up is my favorite sock technique! Having 15 stitches in color A on needle three is correct. You will be decreasing these out as you work the heel flap. Sometimes it just helps to blindly follow the pattern and see how things work out. After a few rows you’ll understand what’s going on. Best of luck and happy knitting! This is my first time working with socks, but any time I work with double-pointed needles, my stitches always seem looser between the needles. So with the socks, the one side that all fits on one needle is very uniform, while the other side split on two seems a bit looser. Is this normal, and will the stitches even themselves out through wear or washes, or am I doing something wrong? Thanks and I LOVE all of these patterns. Thanks for writing in! Working with double points is difficult when it comes to tension between the needles. It takes a lot of practice! Gaps in between the needles happen because of either too much tension or too little. Sometimes the gaps disappear with blocking, but sometimes they are too pronounced to vanish. If you want to try magic loop or using two circulars, you can easily find great tutorials on YouTube. Best of luck and happy knitting! I worked turkish cast on to begin this project. Hi, I was wondering how much yarn is needed to make the men’s large size. I have three skeins of the Anzula Squishy and I’m trying to figure out how much I will have left at the end. Great question! The men’s large size will use approximately 265 yards color A and 170 yards color B. Please note that these are approximate yardages and your amounts may vary. So if you have 2 skeins of color A and 1 skein of color B, you should be able to get 2 pairs of men’s large socks! I can’t wait to knit these socks! It will be my first time knitting socks but I am very comfortable with stranded colorwork and fair isle so I’m hoping it will be pretty easy to pick up the sock-specific techniques. I was wondering if magic-loop two-at-a-time would lend well to this pattern or if the colorwork parts might make it more difficult? Thanks for the question. Two-at-a-time magic loop is tricky for your first sock, but totally doable if you are up for it! Also, you’ll have four balls going at the same time so that might be a bit difficult to manage. I would try one at a time for your first pair so you can really get the sock techniques down and then try two at a time for the next pair. Best of luck! Can we use the same pattern if we want plain color socks? I mean using just one yarn and instead of doing K1a,K1b just K1,K1 with the same color ? Thanks for the question! The answer is that you can of course use one color and omit the pixel stitch for this pattern. Just as long as you have the correct stitch gauge, you should be fine! 1 -do I really cut the yarn after the last (8th) cast on stitch? 2- the yarn over increases seem to make noticeably large holes on the right side of the sock increase side… the left side looked fine… how can I make the fabric tighter with those yo increases? Thank you for writing in. To answer your first question – yes! You will unravel the provisional cast on when you have finished knitting your socks and graft the stitches using Kitchener Stitch to close up the toe. Without seeing your project it can be a little bit tricky to know whats going on. The first thing I thought of is to make sure that you are knitting all your yo’s through the back loop as you come to them. It might also have something to do with your tension. Keeping consistent tension with your stitches can be tricky, especially when you have so few stitches on DPN’s at the beginning of the toe. Are these holes happening before you start knitting every other row or after? I Just took a look at the sample in the shop and I noticed that there are small holes at the increases. They are very small but they are there. I just started working on this pattern and got to the foot portion. What does it mean exactly, when the pattern instructs to “work remaining yo through the back loop”? Thanks for the help! Thank you for reaching out! To work through the back loop you are inserting your into the back of your loop rather than the front of the loop, as you normally would. I hope this makes sense- lest us know how it goes or if you have any further questions! Never made socks before. Can I make these in just one color. (I happen to have a nice ball of beautiful sock yarn on hand.) Obviously, they won’t be as pretty, but it should still be doable, right? Thanks. Thanks for reaching out! You can certainly knit this sock in stockinette- you will just ignore all of the pixel stitch instructions and just knit away. I forgot. Can you make them with a US 2 circular needle instead of a set of double pointed needles? Thanks. Thanks for writing in! Yes, if you are familiar with the magic loop method or using a 9″ circular for socks, you could certainly substitute either of those methods!